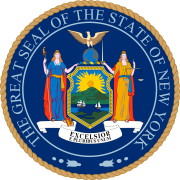 The 1938 New York state election was held on November 8, 1938, to elect the Governor, the Lieutenant Governor, the State Comptroller, the Attorney General, two U.S. Senators and two U.S Representatives-at-large, as well as all members of the New York State Assembly and the New York State Senate. The Republican state convention met on September 29, Speaker Oswald D. Heck presided. They nominated D.A. of New York Thomas E. Dewey for Governor. Also nominated were Frederic H. Bontecou for Lieutenant Governor; Julius Rothstein for Comptroller; Col. Arthur V. McDermott for Attorney General; and John Lord O'Brian and Edward Corsi for the U.S. Senate. The American Labor state convention met on October 3 at the Manhattan Opera House in New York City and nominated the Democratic incumbent Herbert H. Lehman for Governor. They also endorsed Democrats Poletti, Wagner, Mead, Merritt and O'Day; and completed the ticket with Langdon W. Post for Comptroller and Joseph V. O'Leary for Attorney-General. The Socialist Labor Party changed its name and filed a petition to nominate candidates as the "Industrial Government Party. The vote for Governor is used to define ballot access, for all other offices numbers are totals on all tickets for candidates nominated on more than one. This page was last edited on 15 December 2018, at 20:17 (UTC).